For Christmas, I received a very generous gift card from my boss. Knowing that I'm a complete foodie and love nothing more than trying new restaurants, she surprised me with enough in gift cards to treat myself, my boyfriend, and my mom (almost- we went a little over) at dinner! She selected Ocean Prime since it's one of her favorites and guess what?- it became one of mine as well! 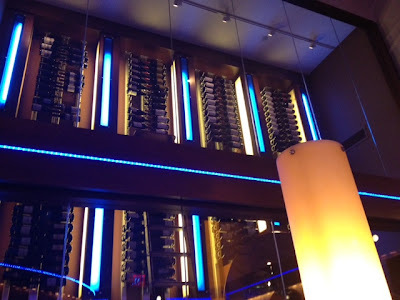 From the moment we walked on the red carpet, literally, before entering the restaurant, I knew this would be a great experience.﻿ Behind the hostess stand, Ocean Prime proudly displays their impressive wine selection. The lobby's walls are also full of articles, proclaiming the greatness that is the Ocean Prime experience, which only served to make me more excited. On our way to our table, we all remarked at the terrific decor and ambiance. It was sophisticated, modern and relaxing. Ocean Prime has a bar/lounge area with live piano playing, drink specials (during happy hour), and a roaring fire to set the perfect mood. In the main dining area, intimate booths line the inner wall and the outer wall is composed mostly of windows where one can see to the outside dining and small lake bordering the restaurant. Now, prior to coming to Ocean Prime, I browsed the menu and asked around for meal and drink suggestions. When I heard that Ocean Prime has a cocktail with dry ice, I knew I had to have it. 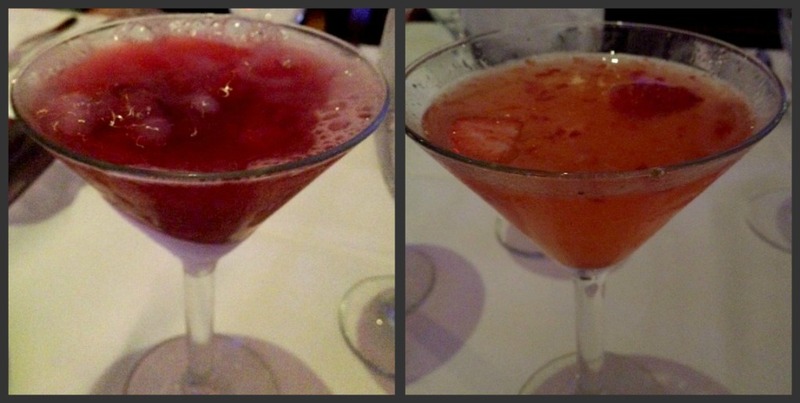 With the perfect name of Berries & Bubbles, this drink did not disappoint. Shaken and poured right at the table, this cocktail immediately started to bubble and "smoke". I'm nothing if not a fan of a little show. Berries & Bubbles is made with Belvedere Citrus Vodka, marinated berries (poured right on top), Ocean Prime's house made Sour and Domaine Chandon Brut Champagne. My mom, preferring very sweet drinks, selected the Strawberry Smash cocktail, made with Bacardi Dragon Berry Rum, muddles fresh strawberries and hand squeezed lime. Although I preferred my choice, the Strawberry Smash can best be described as an adult strawberry Starburst in liquid form. Divine. Next, it was time for our main entrees. Ocean Prime's menu can be overwhelming. It's not because it's a large menu with seemingly unlimited options (think: Cheesecake Factory), but because everything sounds delicious. I seriously wanted a sampler platter. To start, I opted for French Onion Soup. 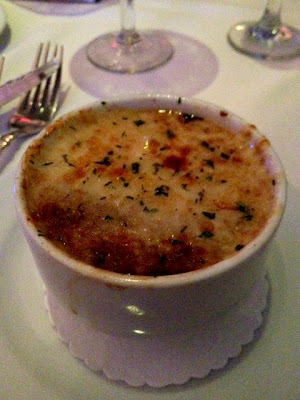 French Onion Soup is one of those things that I have to order whenever, wherever it appears on a menu and Ocean Prime's, as I suspected, was near perfection. Made with a great brandy and aged swiss, I hereby declare Ocean Prime's French Onion Soup in my top 2, right up there with the soup at Malio's Prime Steakhouse, one I rant and rave about often. Good job, Ocean Prime! Eager to taste more of what Ocean Prime had to offer, we snacked on complimentary sourdough bread while waiting for our main courses. Note: when a restaurant offers bread to tide you over, they immediately rank pretty high in my books. 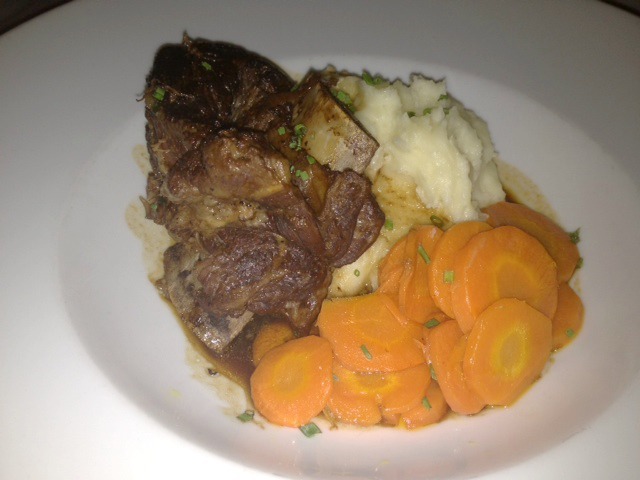 For our main course, I selected the Short Rib "Osso Buco" with horseradish whipped potatoes and caramelized carrots. Yes, I said caramelized carrots. They were out of this world and honestly, I don't even usually like carrots. 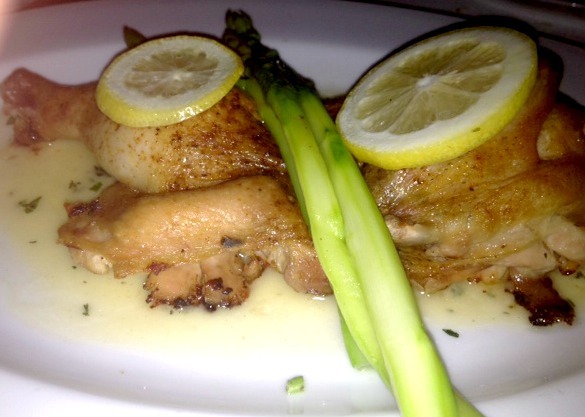 My boyfriend opted for the Gerber Farms Chicken with asparagus and Lemon pan jus. Both of our dishes were featured in the Chef's Compositions section of the menu. All items in this section come with the sides listed. My mom went off of the a la carte menu and chose an 8oz Petite Filet Mignon with a twice-baked baked potato and those caramelized carrots. All of their steaks are prepared with homemade seasoning and while I didn't sample a bite, my mom commented enough for me to know that it was great. The meat from the short rib easily fell off the bone and was incredibly tender. The sauce was so complementary to everything in the dish so I'm glad all of the food was in one bowl. The horseradish whipped potatoes were so different from any other whipped potatoes I've had before and I couldn't get enough of them. Admittedly, I was so obviously satisfied after tasting this chicken that my boyfriend asked me several times if I wanted to switch meals. I stayed with my own, though. The combination of crispy outside, tender inside and the lemon sauce was simply amazing. Everything came together so nicely. Frankly, this is the best chicken I've ever tasted. 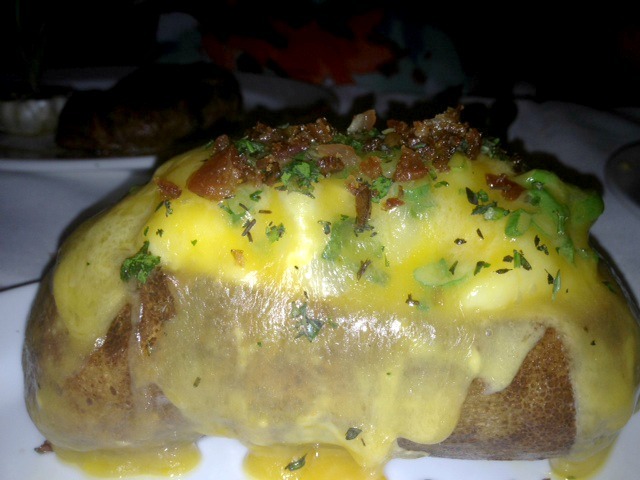 Even though I didn't get a picture of my mom's steak, I just had to capture one of the twice-baked baked potato. All of the articles we were reading in the lobby mentioned this potato so we knew it would be delicious. This potato is made with scallions, applewood smoked bacon and Vermont cheddar cheese and the tastes are much more elegant than the picture would let on. Also, for being a side on an a la carte menu, it was much larger than I thought it'd be. It was easily large enough to split between two people, even three. Of course, a true experience includes dessert so even though we were pretty stuffed, we requested a menu to look over. My mom, the eternal chocolate lover, selected the Chocolate Peanut Butter Pie. I selected the Creme Brulee, one of my favorite dessert choices. The Chocolate Peanut Butter Pie, made with peanut butter mousse and bittersweet chocolate ganache, was similar to a Reese's Cup but with a crust at the bottom, a nice and pleasant touch. The Creme Brulee was vanilla custard with a caramelized sugar top and fresh berries and was unbelievable. I don't think you could get me to stray from this dessert in my future trips to Ocean Prime. I have definitely added Ocean Prime to my list of favorite restaurants and since there is so much on the menu that I want to try, it's a perfect excuse to plan another trip there. Our waitress was attentive and fun and pretty much the sweetest girl ever. We were blown away by the atmosphere from start to finish and will definitely sit in the lounge area next time. Ocean Prime also serves lunch Monday-Friday, from 11:30 a.m. to 4:00 p.m. and this menu has my mouth watering as well. Enjoy the Blu Lounge during happy hour (4pm-6pm) for small plates and specials on select handcrafted cocktails and wines by the glass. 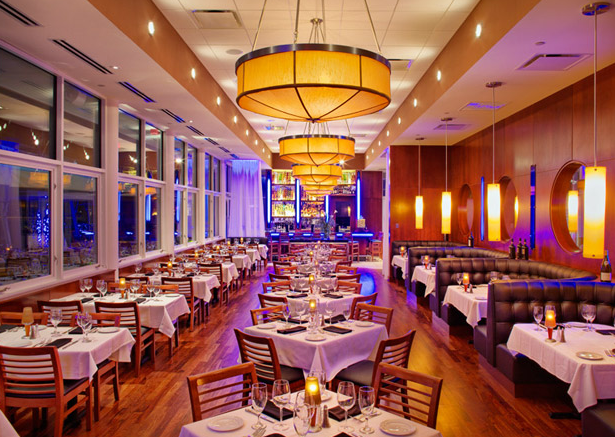 Among others, Ocean Prime has won awards for Best Artisanal Cocktails, Best Dessert, Top 20 Steakhouse, Best Supper Club and Best Outdoor Space!